The models since last night were not well initialized nor did they have hurricane hunter input (which may have been the initialization problem). In addition, there was a problem with one of the weather satellites earlier this morning. For reason, I am not updating the Matthew forecast until I have solid information on which to base an update. I expect that late this afternoon. Sorry for the inconvenience. In the meantime, if you like this blog, please consider one of my books. 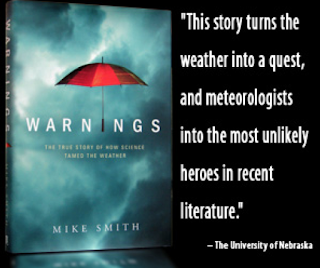 Warnings tells a gripping story of how these warnings get made and how they save lives.